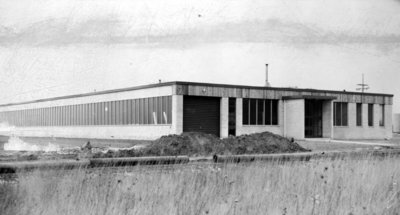 A black and white photograph of North American Steel Equipment Limited. North American Steel Equipment Limited was built in 1957. This picture shows the factory nearing completion. Located at 300 Hopkins Street. North American Steel Equipment Limited, December 1957, The Daily Times-Gazette. Whitby Archives 15-018-001.